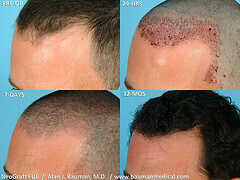 NeoGraft FUE Hair Transplant Pioneer: Dr. Alan Bauman, M.D., A.B.H.R.S. Dr. Bauman was the first board-certified hair transplant surgeon in North America to routinely use the NeoGraft FUE hair transplant system for no-linear-scar hair follicle harvesting, starting in 2007. Since 2002, Dr. Bauman and his surgical team have transplanted more than 2,000,000 follicular units using the FUE technique–making Dr. Bauman one of the most experienced FUE surgeons in the world. FUE is the least invasive hair transplant procedure and leaves absolutely NO linear scar. It has less downtime and less discomfort than traditional “linear” or “strip-harvest” procedures. See some Neograft before and after photos. NEW “Ouchless” Hair Transplant Now Performed at Bauman Medical Group delivers the most comfortable hair transplant possible. Watch the Ouchless Hair Transplant Video here. Internationally Renowned Hair Transplant Surgeon, Dr. Alan Bauman, Adopts Revolutionary FDA-Approved Pain-Eliminating Technology, the BellaNovus “Ouchless Needle,” for Hair Transplant Procedures Boca Raton, Florida–A recently FDA-approved device originally created to eliminate pain associated with the use of needles and syringes for common dermal fillers and neurotoxin injections such as Botox®, Dysport®, Juvederm,® and Restylane® has now been adopted for use by Dr. Alan J. Bauman, the nation’s leading hair transplant surgeon, for use in hair transplantation procedures. “The Ouchless™ Needle is the final ingredient in modern hair transplantation surgery that will serve to completely eliminate patient concerns about the issue of pain associated with the hair transplantation process,” says Dr. Alan J. Bauman. The Ouchless™ Needle (BellaNovus) is a disposable syringe-attachable dispenser that delivers a precise stream of the numbing vapocoolant to the skin just ahead of the tip of the needle before the skin is pierced. The vapocoolant spray immediately refrigerates the skin, thereby reducing the feeling of needle penetration and making the injection significantly more comfortable. This new medical technological device works to instantly reduce the pain associated with having injections and, according to clinical trials, minimizes post-injection numbness, swelling and bruising thereby providing patients a far superior treatment experience. Today, the Ouchless Needle is just one of the many ways Dr. Bauman ensures a comfortable procedure for his patients. If you are interested in learning more about Dr. Bauman’s Ouchless™ Protocol for Hair Transplantation, please contact Dr. Alan J. Bauman for a private consultation. If a surgical procedure is advised, you will be in the hands of an exceptionally caring and well-qualified surgeon. Dr. Bauman offers his patients the demonstrated skills, knowledge, experience and keen artistic eye to yield the best medical and aesthetic result—one hair follicle at a time. In general terms, hair transplantation is the redistribution of ‘permanent’ follicles from the back of the scalp (donor area) into the thinning or the balding areas (recipient area). It is a safe, effective procedure performed under comfortable, computerized local anesthesia (The Wand and Ouchless protocols). Today, unlike old-style “hair-plug“ transplants, follicular-unit micrografting allows coverage of the scalp and the creation of a natural, living and growing hairline for every single patient. Dr. Bauman uses a combination of microsurgical techniques and an artistic eye to carefully determine the angle, orientation and position of each individual transplanted hair in order to achieve results that truly “defy detection.“ We encourage you to browse Dr. Bauman’s portfolio of results to see close-up photos of hairline results he has created. For more detailed information regarding Dr. Bauman’s hair transplant procedures, read the articles about Dr. Bauman in the NY Times, Newsweek, Men’s Health, WIRED, Men’s Fitness as well as South Florida Health and Wellness, Boca Observer and others. Dr. Bauman’s hair restoration procedures and adjunctive medical treatments were featured on NBC’s Dateline, which independently verified and clarified the effectiveness and naturalness of the Dr. Bauman’s hair transplantation techniques. You can track the progress of the Dateline NBC’s “Follicle Five” at www.folliclefive.com. Dr. Bauman’s procedures have also been featured on CNN, FOX News as well as in The New York Times, Newsweek, and Men’s Health Magazine. The latest news videos have been uploaded to www.youtube.com/baumanmedical. As part of Dr. Bauman’s commitment to his patients, he has developed and invested in the latest technologies required to consistently achieve the high level of surgical precision at which he and the Bauman Medical Group surgical team work each day. In this photo, a Surgical Technician at Bauman Medical Group is dissecting individual hair follicles and follicular units under one of Bauman Medical Group’s powerful new digital video microscopes. Improved visualization of the follicles in the harvested donor tissue is now possible. A ‘quantum leap’ in ergonomics and magnification, the videoscopes mean a more efficient dissection process, a better quality and quantity of grafts, and therefore, better results for every patient. The “Trichophytic” Donor Closure Technique Reduces Scar Visibility…Boca Raton, FL–The new “Trichophytic Donor Closure” technique allows for improved camouflage of a linear donor scar when using FUT follicular unit transplantation with a linear harvest. Before the trichophytic (aka “tricho”) closures, a patient could expect their donor scar to be 0-2mm in width. Normally, the surrounding hair would easily cover the scar. For some patients with very short hairstyles or buzzcuts, the resulting donor scar could sometimes be visible. The trichophytic closure is a type of ‘overlapping’ technique which results in hair growing directly through the donor scar. This can dramatically improve coverage of the donor scar in those with short hair. Dr. Bauman uses the trichophytic donor closure technique as a routine part of all of his linear donor harvests. For patients with short hair, this offers an acceptable alternative to FUE (Follicular Unit Extraction), which is typically a less efficient (and oftentimes more expensive) way to harvest hair from the donor. The trichophytic donor closure can be used on patients who have had previous procedures and are looking for improvement in the camouflage of their donor scar, as well as patients who are undergoing hair transplantation for the first time. For more information on trichophytic or ‘tricho’ donor closure techniques, contact Dr. Bauman for a consultation. Dr. Bauman specializes in advanced surgical hair restoration techniques, including refined Follicular Unit Micrografting, using a linear-harvest, as well as minimally-invasive Follicular Unit Extraction (FUE). Each procedure has its individual benefits which can be discussed during your consultation. Unlike other physicians which promote or specialize in only one technique, Dr. Bauman is proficient in a variety of methods of transplantation in order to achieve the best results for each and every patient. In the photo at left, Dr. Bauman is demonstrating to hair restoration surgeons from around the world how he performs the Follicular Unit Extraction (FUE) procedure at the International Society of Hair Restoration Surgery (ISHRS) Live Surgery Workshop in 2003. Later that year in NY, he was the first surgeon to present a poster abstract presentation on FUE at an ISHRS Annual Meeting. 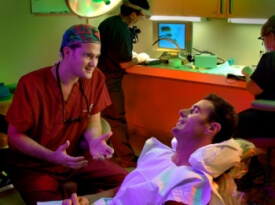 In March of 2004, Dr. Bauman lectured on and demonstrated his FUE technique and his customized FUE instruments at the ISHRS Live Surgery Workshop. In August of 2004, lectured on FUE at the Annual Meeting of the ISHRS in Vancouver, Canada and was asked to sit on a Q&A panel of several FUE surgeons from around the world. He also lectured and sat on a similar “FUE Panel” of surgeons at the 2006 ISHRS conference in San Diego. At ISHRS 2010 in Boston, Dr. Bauman lectured on FUE pitfalls such as graft dessication (drying) and other issues that could occur with larger cases and automated devices, he also brought several patients for Live Patient Viewing portion of the meeting. With the latest instrumentation, doctors performing Follicular Unit Extraction (FUE), can transplant individual hairs without harvesting hair from a “donor strip.” Since no scalpels or stitches are used, healing is quick and comfortable. The FUE procedure is ideal for patients who have short hair, an active lifestyle, and don’t want to have a linear donor scar. FUE procedures are more labor intensive than traditional ‘linear’ micrografting techniques. Today, more than ten years later, Dr. Bauman and his surgical team have transplanted over 2 Million follicular unit grafts using the FUE method with devices such as NeoGraft and the ARTAS robotic-assisted hair transplant system. Proficient at both FUE and traditional ‘linear’ techniques, Dr. Bauman can guide you as to which procedure would best suit your needs. Regardless of the harvesting method, Dr. Bauman continues to use his artistic skill to recreate a natural hairline for each and every patient. Looking for Before and After Photos of a NeoGraft FUE Hair Transplant? There are plenty of before and after photos of Dr. Alan Bauman’s hair transplant patients located here. Since 2002, Dr. Alan Bauman has performed manual FUE techniques to harvest hair for his patients, however the NeoGraft device makes this process much more efficient, allowing more hair to be harvested and implanted with each hair transplant session. While some inexperienced doctors and their teams have difficulty producing good results with NeoGraft FUE, Dr. Bauman has refined his techniques to provide maximum growth from his procedures and exceptionally natural hairlines. See for yourself! Less invasive NeoGraft FUE allows the harvesting of hair follicles without leaving a linear scar and with less discomfort during the healing process. NeoGraft patients may return to most athletic activity within three days*… Don’t try that with stitches or staples in your scalp! Take a look at a slideshow of before and after results of the NeoGraft FUE hair transplant by visiting NeoGraft Results Slideshow. PRP Enhances Healing and Hair Growth After Hair Transplantation. Today, more and more doctors performing hair transplantation are using PRP to help wounds heal faster and reduce the cosmetic downtime from a hair transplant procedure. PRP is used to accelerate the body’s recovery mechanisms and create an optimal environment for wound healing to occur comfortably and quickly. PRP – platelet rich plasma – helps keep the wound moist like a biologic bandage and delivers the body’s own growth factors and nutrients. PRP contains activated platelets and promotes natural healing without side effects or risks. Interestingly, these growth factors also enhance hair growth. As a natural response to injury, platelets are crucial to the healing of wounds. In order for a wound to heal naturally, it must have growth factors provided by platelets. PRP harnesses each person’s own natural healing processes, delivering the growth factors and nutrients that help cells grow and new tissue to form. PRP can restore the balance in the wound environment to help hair transplants heal naturally with less redness, less crusting and less swelling. Dr. Alan J. Bauman and every member of his hair transplant team have successfully completed the Cytomedix™ AutoloGel System Certification Training on the preparation of FDA-approved PRP as of August 24, 2011. Dr. Bauman was one of the first hair transplant surgeons in the world to have his entire surgical team certified in the preparation of PRP for wound healing and hair regrowth. Dr. Bauman has used PRP systems such as YesPRP, Harvest and PurePRP by Emcyte. Today, he uses a Beckman-Coulter Cell-Counter to verify the platelet concentration of EVERY single PRP treatment prepared in his office. PRP reduces scalp scabbing, swelling and redness and improves hair growth. A study by RJ Reese, shows that patients receivingl PRP after hair transplant had improved healing compared to those who did not receive PRP. Reese RJ, A single-blinded, randomized controlled study of the use of autologous platelet rich plasma (PRP) as a medium to reduce scalp hair transplant adverse events. Hair Transplant Forum Int’l, March/April 2008:pp 51-52.